Speaking at the 18th edition of India Today Conclave 2019 in New Delhi Friday Tharoor presented interesting insights about Hinduism and Hindutva. 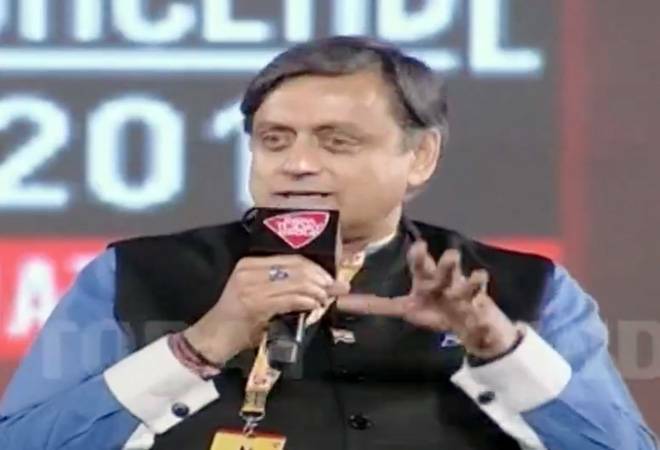 Speaking at the 18th edition of India Today Conclave 2019, Congress leader Shashi Tharoor explained how Hindutva digresses from Hinduism and violates its essential credo of Ahinsa, co-existence and acceptance. Congress leader Shashi Tharoor today said that the Hinduism and Hindutva are different from each other and they need to be understood in their essential elements. Speaking at the 18th edition of India Today Conclave 2019 in New Delhi Friday Tharoor presented interesting insights on the contentious topic. "Hinduism is a very large, eclectic, vastly encompassing religion that has tremendous amount of choice of freedom within it, which is actually one of the greatest strengths of Hinduism. The problem with Hindutva is that it takes this vast all encompassing religion and tries to reduce it to something much narrower and specifically tie it to a political identity." the Congress leader articulated. Tharoor further outlined, "For me Hinduism is a faith and it is a very broadminded faith that fundamentally rests on notions of an acceptance of difference. More than tolerance Hinduism is about acceptance as it is something far more profound, it is about respecting each other's truth. But, Hindutva doesn't admit that, it rather believes that its way is the only way and everybody else is either inferior or must be excluded, they must be bashed on their heads and that's what my problem with Hindutva is." Talking about how Hindutva digresses from Hinduism and violates its essential credo of Ahinsa, co-existence and acceptance, Tharoor pronounced, "Hinduism as culture has featured in Nehruvian politics as well. The problem that many of us have with Hindutva is not the Hindu aspect of it, but the non-Hindu aspect of which includes the violation of the principle of Ahinsa, Satya, a violation of all the notions of co-existence and acceptance through a policy of bigotry, exclusion, discrimination, violence and so on. That's the problem many people have with Hindutva." On the contentious issue of Sabrimala where both Congress and BJP have been accused of playing electoral politics using religion for vote bank politics, Tharoor highlighted, "The rights of the believers must be respected. The temple has right to certain rituals and practices, as do temples have all across country. We don't have any problem with that but if it's a constitutional or legal issue, it should be resolved that way." "We don't believe in BJP's approach of going out on streets, obstructing people, vandalizing cars, attacking police, throwing stones and converting a sacred shrine into a stage of political theatre, but on the substance of the issue, we are supporting the review petition before the Supreme Court," he said. Speaking on the law governing the Triple Talaq, Tharoor stated that the problem with the same is that the law doesn't help Muslim women but rather penalises Muslim men. It criminalises a civil issue between two people in a marriage which is not working for their own reasons. The Congress leader also vocalised his view on the issue of cow slaughter and beef eating in the country saying that every state's cultural rights must be respected when it comes to eating beef. "It should be a state issue and that consuming beef is looked upon differently across the country from a state like Kerala to Madhya Pradesh," he insisted.